Are you feeling anxious? | JoyDay! Are you bold? Would you call yourself a risk-taker? Or… does that cause you to feel anxious? In the past I was a bit of a risk-taker. Except in areas where I might injure my body. It’s amazing what one broken arm and sleeping with ten pounds of sand hanging from a cast, while trying to sleep sitting up in a chair for six weeks, did to cure me from that. And then, there was that bad business decision which has made me much more cautious. I think we can agree that we need to use discretion, common sense, and wisdom in our daily activities. Fear, however, should not control our thoughts and activities. This morning I shared the “verse of the day” from Bible Gateway on Facebook. I had stopped by Bible Gateway to capture another verse to share for my daily morning greeting and sensed that I need to use this one instead. but of power, and love, and self-control. After I posted the verse, it stuck with me. Usually when I sit down to write the weekly JoyDay! post, I usually have something in mind that was impressed upon my heart during the week that I know I’m supposed to address. Sometimes, I have nothing in mind until shortly before I sit down to write. Today was one of those days. Since I had asked the Lord for direction, my spirit was open. And this verse continually came to mind as I took care of laundry and put the chicken on to simmer for tonight’s dinner. Lately, I think God is working on my heart, preparing me for something ahead. I have a sense that he wants me to get ready to live with wild abandon. Okay that may be an exaggeration. Then again, maybe not. God usually wants us to live outside our comfort zones. We get to know God best when we have to rely on him completely when we are outside that “safe” place. I’ve been living outside my comfort zone for quite a while now…. but I sense he’s got something a bit different in store soon. I don’t know what lies ahead… but I know that God wants me to trust him there. Do you feel like you’re being pushed (nudged?) out of your safe place? It’s kind of scary isn’t it? One is to approach it with dread. To mull over every single negative possibility imaginable. The second approach is to step forward with joyful anticipation, trusting that God will keep hold of you with his strong right hand. Are you feeling anxious? Afraid? Filled with dread? That does not come from God. To do that is to exercise the self-control that comes from God. We know that love comes from God and he wants us to love like he does. That isn’t usually something we struggle with… other than receiving his love as freely as he gives it. However, have you ever thought that you could have power? When we live in fear and foreboding… we are powerless. When we put on the armor of God we become powerful. Not in our strength… but in HIS! 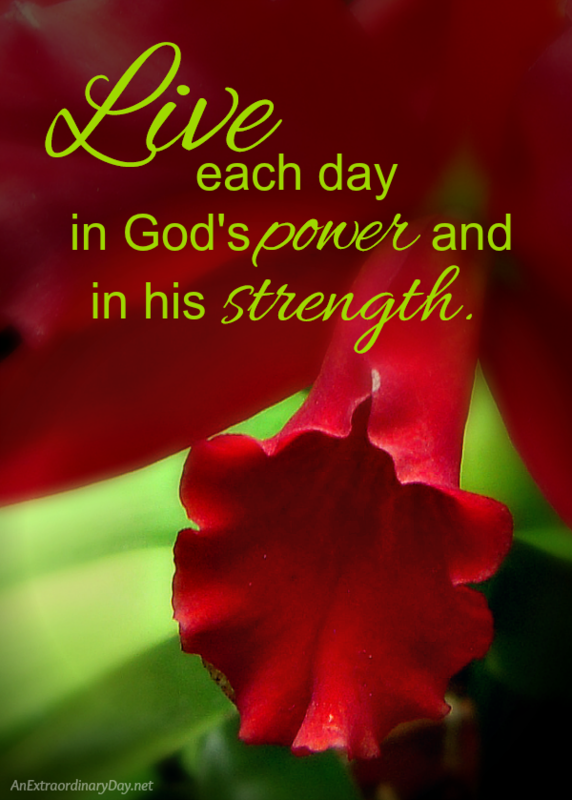 I want to live each day in God’s power and in his strength. So I bow in prayer before the Father from whom every family in heaven and on earth gets its true name. I ask the Father in his great glory to give you the power to be strong inwardly through his Spirit. I pray that Christ will live in your hearts by faith and that your life will be strong in love and be built on love. And I pray that you and all God’s holy people will have the power to understand the greatness of Christ’s love—how wide and how long and how high and how deep that love is. Christ’s love is greater than anyone can ever know, but I pray that you will be able to know that love. Then you can be filled with the fullness of God. This is a prayer that you can pray for yourself as well. So I bow in prayer before the you Father from whom every family in heaven and on earth gets its true name. I ask the you Father in his your great glory to give you me the power to be strong inwardly through his your Spirit. I pray that Christ will live in your my hearts by faith and that your my life will be strong in love and be built on love. And I pray that you I and all God’s holy people will have the power to understand the greatness of Christ’s love—how wide and how long and how high and how deep that love is. Christ’s love is greater than anyone can ever know, but I pray that you I will be able to know that love. Then you I can be filled with the fullness of God. With God’s power working in us, God can do much, much more than anything we can ask or imagine. To him be glory in the church and in Christ Jesus for all time, forever and ever. Amen. Are you ready to live victoriously in power, love, and self-control? Are you ready to shake off… or maybe even stomp out the spirit of fear? What are you going to do to live in joyful anticipation every day? your constant love and kindness. helping my dear friend through one of the most difficult days she has ever faced. being able to make a difference in the lives of others. two beautiful days for making out-of-town trips. blindingly beautiful sunshine in the most frigid temperatures. getting to catch up with a friend I haven’t talked with for a long while. your hand of blessing on us. My goodness, how beautiful are those photos. And how beautiful is that prayer. Living in that space, basking in G-d’s love is an amazing place. Fears just….vanish. I know this from experience and can still find myself plopping out of that space and grabbing hold of the reigns. LOL. I don’t nudge G-d out, I shove hard. Warp speed with my hair on fire, I’m gonna get ‘er done! Wise person in my life calls that EGO. (Edge G-d Out). –I can actually see snow melting in the bright sunshine today. I didn’t make that happen. –a stranger told me of his cancer journey…and how it’s arrested today. I didn’t make that miracle happen. –I get to send cards to a gal battling stage IV lung cancer. Was a time a wouldn’t risk doing loving acts. Thank You for helping me find love. –My car started on those -24° mornings….I didn’t expect that to happen. –I got to teach some things that were taught to me….things that made a huge difference in my life. WOW that paths were crossed so I could! THAT was way cool. –The bills are paid and there’s money in a savings account. How’d THAT happen! LOL…Seriously cool considering my money management skills. Look to see where G-d IS, WPIML tells me. And boy is He loving me a LOT! Thanks Mel… these photos were taken at Phipps Conservatory back when I lived in PA. I was going through that “stack” of photos and discovered many I hadn’t used. So fun to revisit them and the memories made that day. 2. I liked the prayer verses. I’d never cut that prayer out to better focus on it though I’ve read it so many times. The Holy Spirit opened my eyes in a new way and I shared the verses with friends. Thank you Lord for using this devotional to encourage my sweet friend, Gwen, and then others, too. And thank you for all the wonderful ways you blessed Gwen and Curt. Lord, we continue to believe and trust that you are working to complete Curt’s vision and healing, in Jesus’ Name. May your week overflow with HIS JOY!! Our family is facing change in the near future . . . and like most people I’m not a fan of change. So often, fear and change go hand-in-hand. I’m not a fan of fear either. So it is in my fear that I turn to God the most . . . and pray more than ever. I have this poem posted above my desk, and I read it often . . . I am happiest – and feel most at peace – when I pray and trust in our Lord. For with Him – anything is possible. I feel that it’s incredibly beneficial to remember – and count – our blessings every single day. For it is when we count our blessings – that we can see that God is with us, and cares for us . . . and loves us dearly. Dear Suzanne… I do not know what lies ahead for you and your family, but I’m grateful to know that you know and trust the ONE who will hold you close in the days and weeks ahead. God surely knew we would struggle with fear, even though Jesus should be all we need to trust and not fear. You are so right… developing that thankful heart sets us up to trust God even more. Thanks for stopping by… sending hugs in return!! I so enjoyed all of this lovely post! You had so much to share with all of us today. Thank you, Diane! I printed several of the prayers and am sure I will refer back to them often. 2. Dr. Bassavorashu, who is such an incredible Rheumatologist in that she leaves no stone un-turned. Her persistence and dedication to her patients is to be admired. Also, for Dr. Michael who has the knowledge to remove the small lump from inside my mouth tomorrow. 3. My dear brother, Proctor, who calls me from Chicago almost every night to see how my health is. I love you so much, Proc. 3.Taking care of sweet Dorothy as she struggles her way through the chemotherapy necessary to kill off the unwelcome cancer in her esophagus. Please watch over her always. 4. For allowing me the privilege of being Guy Beliveau’s wife. His love and attention overwhelm me at times. He works hard on my behalf as I am unable to work and earn a decent living. Lord, it frightens me. What would I do without him? God bless Guy. 5. For the excitement allowed for this Granmama Lulu!!! Lyla will be here soon! I so look forward to loving another precious grandchild! 6. For the time I have with my precious Mother. Please help her to remain as lucid as possible as she takes this frightening Alzheimer’s journey. 7. For my lovely home where I am able to spend quiet, stress free days. The feeling of safety is so very much appreciated, Lord. Thank you with all of my heart. Oh Lucy, I am so glad you were blessed. God is sooo good!! And that prayer is an amazing prayer to pray. Periodically I go through it and pray it. Such wonderful truth to impress on our hearts and minds there. Lucy… I rejoice with you in the many ways God is touching your life and tenderly caring for you. I will keep you in prayer tonight and tomorrow, praying that your surgery goes perfectly and easily for you.